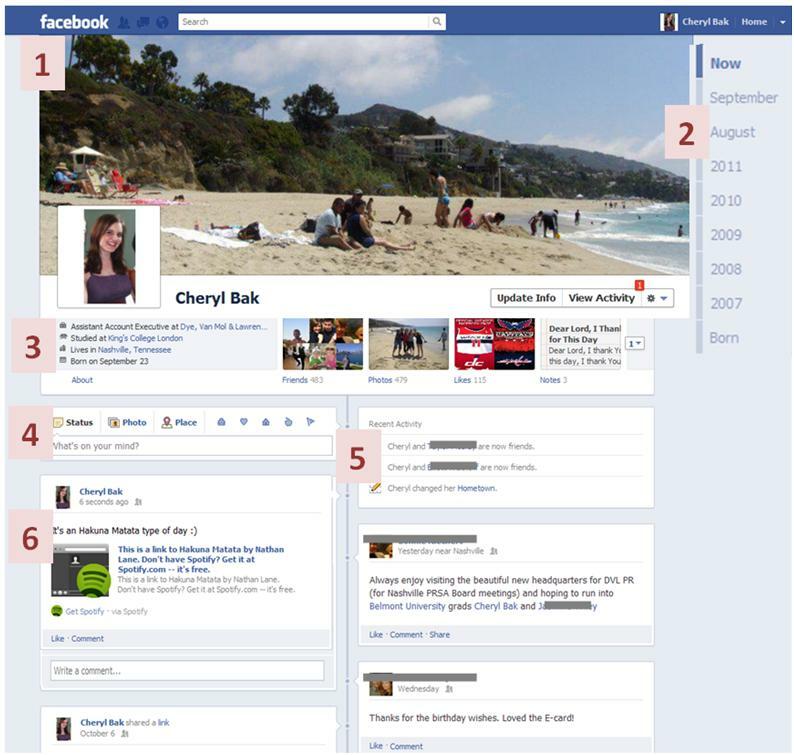 Timeline is basically a revamped profile format that allows you to customize what’s visible from your Facebook history. Thus, older items don’t have to disappear when you create new actions. You will also be able to highlight certain actions, so they stand out in your timeline. It’s no secret Zuckerberg believes in a “web where the default is social.” Timeline will allow users even more chances to share information and experiences of all kinds with their friends. Timeline has been in beta since Sept. 22, and although it was originally scheduled for public release at the end of September, the current ‘go-live’ date is Oct. 21. We’d like to give you a little preview of what your new Facebook profile will look like. Cover: The first thing people will see on your Timeline. It’s a panoramic, original portrait that represents who you are. For some examples, Mashable has highlighted 10 creative Timeline Design Covers. Your profile photo will still be visible in the bottom left corner of the Cover. Scrollbar: On the right side of the timeline, the scrollbar allows users to quickly locate a specific time in someone’s life and view Facebook activity during that period. Shortcuts: This includes the entire user’s “anchor” information, such as bio info, friends, photo albums, “Likes,” apps, notes and more in one central place. Updates: Facebook still asks “What’s on your mind?,” but now you can detail specific life events in different categories, including Work and Education; Family and Relationships; Living; Health and Wellness; and Milestones and Experiences. You can even back date events and milestones. Some events are pre-set, like getting a tattoo, having a child or adopting a pet, but you can also create a custom life event or milestone. Let’s say you got a pet. You can include its name, type of animal, breed, location, date, story, a photo, and also tag who you were with when you got it. Applications: With Timeline, the notorious “Like” button will have to share its page space with new verbs. Users will also have the option to “read,” “watch,” “listen to,” “cook,” or “high five” something, among a myriad of other actions. These actions can come from various company applications, such as the increasingly popular, Spotify music sharing service. In Timeline, applications will be a primary way for companies to better integrate their brands with Facebook users. Businesses will be able to offer more opportunities for their fans to share their products, information, services, etc., in more creative ways. Originally a site to help college students to connect, Facebook is ever evolving and becoming more business and marketing friendly. Organizations with a social media presence will need to keep up with the new Facebook interface, but as each organization is unique, it’s imperative to evaluate and strategize to ensure the best return on engagement.